Address: Avenida 1º de Maio Nº 18, Castelo Branco (Región Centro), Portugal. Located in the heart of the historic city of Castelo Branco, Arraiana offers air-conditioned rooms with a private bathroom. Castelo Branco‎ railway station and Jardim do Parque da Cidade are within 10 minutes’ walking distance. 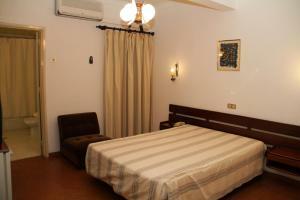 Each room is equipped with free Wi-Fi, a cable TV and a minibar. The private bathroom has a bath or shower and a hairdryer. There is a 24-hour front desk. Breakfast is served daily in the dining room. Guests can enjoy local and national Portuguese cuisine and wines in the several cafés, bars and restaurants within a 5-minute walk away. Arraiana has a seating area where guests can watch TV, enjoy refreshments from the bar or make use of the free Wi-Fi available. Free public parking is available on site.